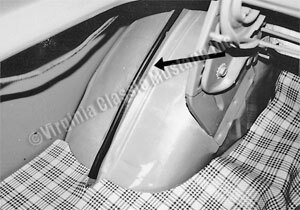 1965-70 V8 Mustang Trunk Wheel House Protective Strip. Vinyl strip that fits on LH Wheel House seam in trunk. Protects any cargo or luggage from getting cut on wheel housing seam. Originally used on LH side only.